The BdB private banking association said the fact that the threat of deflation has disappeared in the euro zone and inflation was picking up justified its recommendation. “Such a step must be prepared very, very well” and policymakers should communicate it carefully, BdB head Michael Kemmer told Deutschlandfunk radio on Thursday. “But it would be important, I think, that the ECB today opens the door to the exit (of its expansive monetary policy),” Kemmer said. How would that door open? 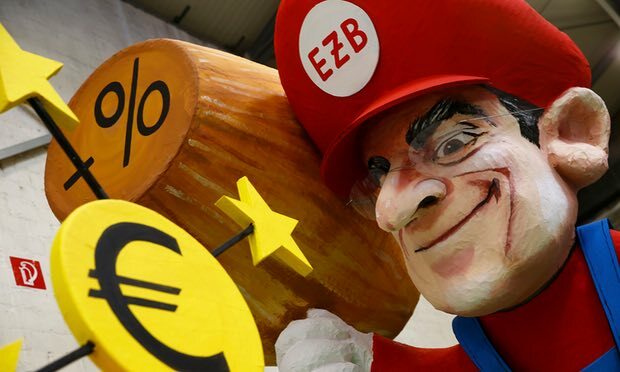 One option is that the ECB could drop its pledge that interest rates would remain at current or lower levels for an extended period. Or, Mario Draghi could outline how it would slow (or taper) its QE programme, from €80bn per month of new bond purchases. But as flagged earlier, many analysts think there are good reasons to leave the exit door locked. Draghi doesn’t want a repeat of 2011 or 2008, when the ECB tightened too quickly. This fear is likely to drive policymakers to remain dovish and keep the taps open. The risks remain to the downside - even with what markets consider ‘too much’ QE. The ‘high class problem’ talked about by Draghi is that the European economy is doing better and the talk is now of tightening. The longer the ECB is minded to refrain from changing policy, the more markets will expect a rate rise or tapering to come. Indeed markets are doing a lot of the tightening work for the ECB as the front end of the yield curve is rising.